The punji stick or punji stake is a type of booby trapped stake. It is a simple spike, made out of wood or bamboo, which is sharpened and heated. Punji sticks are usually deployed in substantial numbers. Punji sticks are banned from use as weaponry under the 1980 Convention on Certain Conventional Weapons. 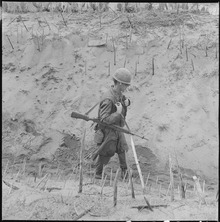 Punji sticks would be placed in areas likely to be passed through by enemy troops. The presence of punji sticks may be camouflaged by natural undergrowth, crops, grass, brush or similar materials. They were often incorporated into various types of traps; for example, a camouflaged pit into which a soldier might fall (it would then be a trou de loup). Sometimes a pit would be dug with punji sticks in the sides pointing downward at an angle. A soldier stepping into the pit would find it impossible to remove their leg without doing severe damage, and injuries might be incurred by the simple act of falling forward while one's leg is in a narrow, vertical, stake-lined pit. Such pits would require time and care to dig the soldier's leg out, immobilizing the unit longer than if the foot were simply pierced, in which case the victim could be evacuated by stretcher or firefighter's carry if necessary. Other additional measures include coating the sticks in poison from plants, animal venom, or even human feces, causing infection or poisoning in the victim after being pierced by the sticks, even if the injury itself was not life-threatening. Punji sticks were sometimes deployed in the preparation of an ambush. Soldiers lying in wait for the enemy to pass would deploy punji sticks in the areas where the surprised enemy might be expected to take cover, thus, soldiers diving for cover would impale themselves. The point of penetration was usually in the foot or lower leg area. Punji sticks were not necessarily meant to kill the person who stepped on it; rather, they were sometimes designed specifically to only wound the enemy and slow or halt their unit while the victim was evacuated to a medical facility. In the Vietnam War, the Viet Cong used this method to force the wounded soldier to be transported by helicopter to a medical hospital for treatment. ^ a b c d Lanning, Michael; Cragg, Dan (1992). Inside the VC and the NVA: The Real Story of North Vietnam's Armed Forces. Ivy Books. pp. 120–168. ^ The Oxford English Dictionary, third edition, (September 2007) list alternative spellings in its entry for "punji stake (or stick)": panja, panjee, panjie, panji, and punge all of which the editors note are about as common as the spelling they use. ^ Geneva, United Nations Office of. "Where global solutions are shaped for you - Disarmament". www.un.org. ^ Virgil Erwin, "Cat Lo: A Memoir of Invincible Youth"